Glottenham is a fabulous 160 acre family working farm set in the High Weald area of Outstanding Natural Beauty. It is a mixed farm, with around 20 acres of woodland, plus arable and grazing for sheep and Sussex beef cattle. Glottenham now offers eco-glamping in 4 units at the main site from Easter til October, plus a diverse selection of units in the Family Fields and choice secluded glades during August. The farm, on the outskirts of Robertsbridge, lies on a hill between two valleys, with streams on either side which feed into the River Rother. At the highest point is the site of Glottenham Castle, a scheduled monument. The castle itself was removed in the sixteenth century, but the moat and raised mound is still in evidence. For latest availability and best prices for Glottenham Castle, please use the Date Search above. 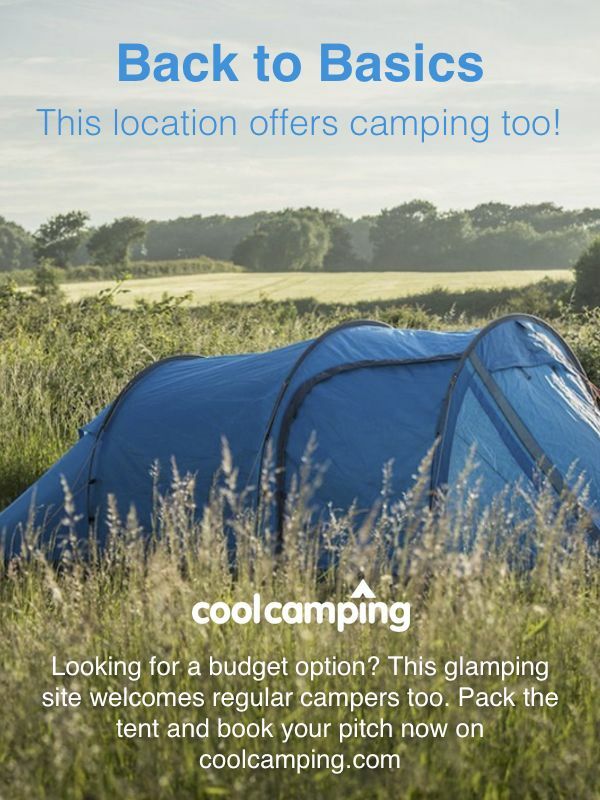 6 compost toilets (plus 4 extra, temporary ones in summer), 3 gas-heated outdoor showers, water standpipes and an extra hang-out space in a 24ft yurt with sofas, beanbags, games and books. Separate car parking. 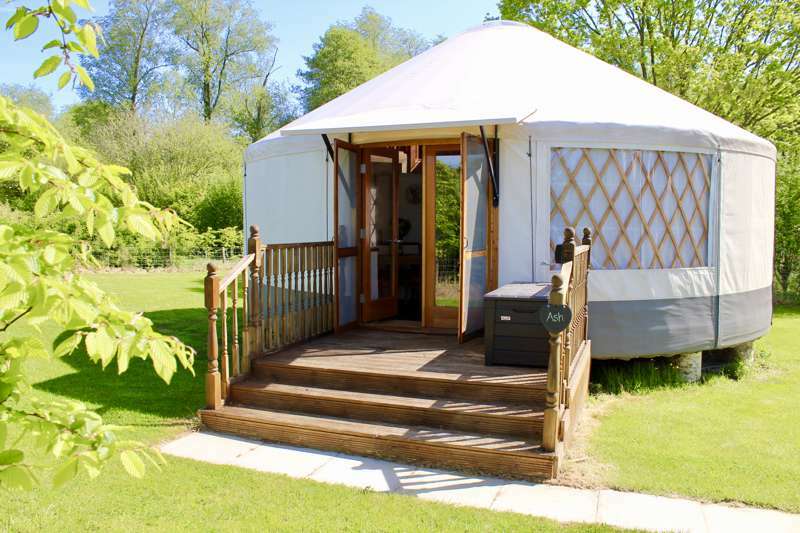 Each glamping unit is individually furnished (though all have comfortable beds, wood-burning stoves and come with woodland kitchen facilities) – see individual units for further details. There are no electric hook-ups but you can hire a Bio-lite Stove which converts heat into electrical charge for USB devices (tablets, phones and so on) and regular campfires are permitted. Firewood, charcoal and local produce hampers available. 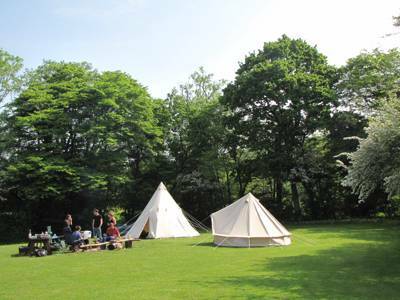 See their website for further details of the on-site Forest School, which teaches foraging, herbal medicine, woodland crafts, art, wild cooking and bushcraft skills for adults, families and kids. The historic town of Battle, site of the pivotal 1066 conflict, is just down the road. You can visit the famous Abbey and Battlefield (01424 775705) where you'll find a visitors centre featuring CGI films and interactive displays. Nearby Hastings Old Town is a charming, artsy commune – the seafront's iconic black net-huts, evidence of the largest beach-launched fleet in Europe. The black, angular lines of the adjacent Jerwood Gallery (01424 728377) of modern and contemporary art provides a pleasing contrast. The boho Norman Road in neighbouring St Leonards-on-Sea rivals Brighton for unique independent shops (particularly art and antiques). Around 20mins away, the Bedgebury Pinetum (01580 879842) has some fantastic walks and cycle routes (cycle hire available), plus a Go Ape! (0843 770 3573). Bodiam Castle (01580 830196) is the quintessential English castle. Entry to the grounds is free, but the entry fee to the castle (adults £7/children £3.50) is worth it for the views from the top of the towers. They also put on free activities for kids during the summer holidays. Bateman's (01435 882302), the home of Rudyard Kipling is also nearby, while the picturesque cobbled streets of Rye (under half an hour away) are full of medieval charm. East Sussex has an embarrassment of wonderful local produce – from cider and wine, to Glottenham's own Sussex beef cattle (not to mention eggs from the free-range chickens). Unsurprisingly, there are a wealth of artisan farm shops nearby – Poppinghole Farm (01580 880503), Buster's (01580 882020) (with its own butchery), and a little further afield Catsfield's Great Park Farm (01424 772531) are among the finest. Should you find yourself unable to leave the delights ofGlottenham, Emma and Rob can supply you with a choice of tasty, locally-sourced hampers. There is a wood fired pizza oven which can be fired up if there is enough demand – nothing says luxury camping like homemade pizzas, right? Or you can arrange an afternoon learning how to build your own oven, make dough and create your own pizza! Robertsbridge is similarly sorted for fabulous pubs. The George Inn (01580 880315) is a welcoming, family-friendly inn with an inventive menu of pub grub favourites and a fine selection of Kent and Sussex wines. The Ostritch (01580 881737) with its quirky tropical garden and the Salehurst Halt (01580 880620) are also decent shouts. For something a little more exotic, The New Spice (01580 881999) Indian restaurant is also garnering rave reviews. From London: Take the A21 from M25, heading south to Hastings. At Hurst Green carry on through the village and down the hill. Cross the roundabout (don’t turn into Robertsbridge village) and continue 1 mile up the hill. Take the first turning on the right, signposted to Robertsbridge, then the first left into Heathfield Gardens. Follow the road through the houses and, before you go under the railway bridge, there is a lane to the left, signposted to Glottenham Nursing Home. Carry on up the farm lane for 1 mile and go up the hill at the end. You will pass an oast house on your left, and the road splits into 3. Take the right hand fork and continue straight up and past the large farm barn. Continue along the farm track and parking/reception will be marked after 500 yards. Robertsbridge station is on the mainline from Charing Cross to Hastings, and is accessible from Brighton, changing at St Leonards, Warrior Square. Pick-up/drop-off service can be arranged from the station for £10. 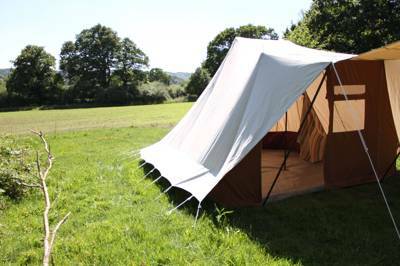 10 grass camping pitches, 2 yurts and 2 geo-domes, plus a private area for group hire with a yurt and space for up to 5 tents.